When I installed the gearbox I had to guess the position of the spacers on the mounting studs. 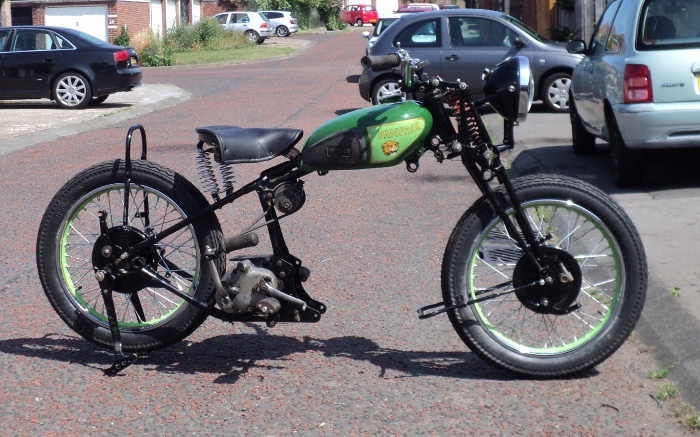 If I got it wrong it would mean that the gearbox would be too far over to the right and the chain sprockets would be out of alignment. This is Not A Good Thing, it leads to heavy chain and sprocket wear and also the risk of the chain “derailing” and jumping the sprocket and locking thing up. So it’s necessary for me to check the chain alignment. First it’s just a quick visual by sighting from the rear of the bike along the rear-wheel and gearbox sprockets. This shows that the alignment is approximately right so I run a chain on to the sprockets and sight along that. Not quite so favourable, looks to be off a bit to the right but not by the half-inch that misplacing the spacers would give. So we’ll check the alignment of the primary drive. Sight over the engine and clutch sprockets, looks OK so drop a chain across them and check it again, this time things line up nicely . So, I have the primary chain line right, so the gearbox is where it should be, but the final drive is a bit out. I’m using new sprockets on both the gearbox output and the rear wheel so which is out? Since the primary chain-case has not yet been installed the gearbox sprocket is easiest to get at so let’s have a look there first!. The sprocket is hard home on the shaft against the spacer ring so that’s not the problem, but it’s a new generic “Burman gearbox” sprocket so better compare it with the old one. Obvious difference is that the Panther sprocket has a recessed face but the generic Burman has not, but all this will do is to allow the securing nut to sit deeper into it so it’s not that. On the back of the sprocket there is a raised boss that bears against the spacer ring and they look different, check them out with a depth gauge and I find the Panther sprockets boss is 2.5mm deeper than that on the Burman. This would move the Burman sprocket over to the right and closer to the gearbox and that’s exactly the problem. Remedy is going to be to make up a new spacer ring to fit behind the sprocket to move it 2.5mm to the left and as this will reduce the threaded depth of the sprockets retaining nut I’ll need to dish the sprocket to match the Panther one as well, to make sure the nut has full engagement on its threads. To finish I decided to fit the cylinder head so I could also fit the top engine mounts from it to the frame to remove the strain of the weighty motor being only half fixed in its frame. It now seems obvious that I need to replace the push-rod tube, it’ll be cheaper than having it re-chromed and giving the alloy work a good scouring, I don’t want to bead-blast the alloy as that gives the wrong patina to the parts so it’s going to be scrubbing brush work with Jizer followed by soap and water. I have boiled cases in an old wash-boiler before using soap-powder and they came up well but I no longer have a wash-boiler and they are not now readily available so that options now gone. This entry was posted in Panther on July 21, 2013 by Drew. Now the motor has been timed all the work on the bottom end is complete and all that is left to be done on the motor is with the cylinder head. However as this is a cast-iron head it is a heavy lump and the motor is heavy enough to manage without it so I’m going to fit the motor and barrel into the frame as is and then bolt the head on once it’s finished. In this photo you can see two sockets on diagonally opposite head bolts as spacers under the head nuts. The purpose of these is to keep the barrel down snug on the crankcase to make the motor easier to handle. These bolts are actually the tops of a pair of long U-bolts that go down and round the main bearing housings so that once the head is on and bolted down, the barrel is sandwiched between it and the crankcase locking the whole into one solid lump, essential when the motor is used as a stressed frame member as it is on a Panther where the motor takes the place of the front downtube of the frame. Anyway with the barrel held down with these sockets the motor can be “cradled” to carry it and I’ve got to carry it out to the garage from the workshop, including down a flight of stairs! and it’s B—-y heavy! Once I get it there it’s definitely time to knock off for a coffee! Back to the job and now it’s time to build a platform of timber planks between the wheels of the bike and then lift the motor onto it. Needless to say the holes in the motor mounting lugs on the motor do not align with the holes in the engine plates! Sodd’s Law rears it’s ugly head again! But I can get a screwdriver into the top mount, so I use that as a podger to pull things into line. With one stud now in place it’s just a case of lift at the front of the motor and the other studs can be slid into place, remove the timbers and that’s it! another step on the way. 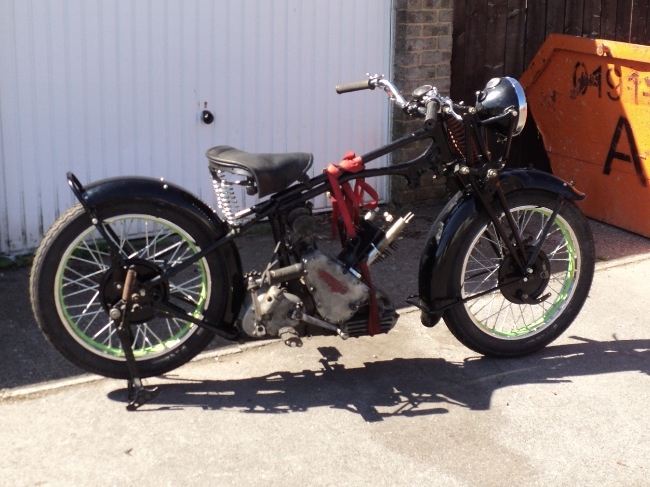 In theory there’s no need to support the front of the motor, the frame and engine plates being substantial pieces of metal, but as a case of “Belt and Braces” I’ve run a webbing strap round under the front of the sump and up round the frame top tubes. This entry was posted in Panther on July 19, 2013 by Drew. One of the most fiddly things in a rebuild is setting the ignition timing. The big Panther uses a magneto for its ignition, if you are not familiar with these the simplest description of a magneto is that it is a totally self-contained ignition generator. It does not require a battery or any external connections other than the high-tension lead to the spark plug. Basicly it works by spinning a coil of wire, the armature, between the poles of a powerful magnet. As in a battery/coil ignition system you have a coil with a pair of points that interupt the low voltage side to induce a high voltage in the other side of the coil and that gives you the spark. To get the motor to run the spark must occur at the correct place as the engine turns over and that is your “Ignition timing”. The original manufacturer determines the best point for the spark to occur when developing the motor and this figure is published in the specifications for the vehicle, with the pre-war M100 Panther that figure is 19/32nd inch before the Top Dead Centre (TDC) on the compression stroke. 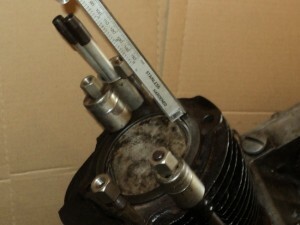 TDC is of course the point when the piston reaches the very top of its motion up the cylinder barrel. That’s general stuff, now a bit more specific. On a Panther the magneto bolts to a platform area behind the cylinder. 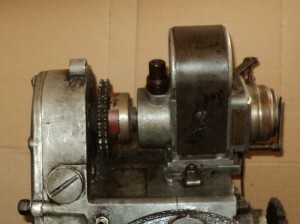 Uncommonly it is not driven directly from the timing gearing of the bike, on a Panther this gearing drives a disc outside the timing case and this disc not only drives the magneto but has a sprocket formed on it that drives the dynamo. 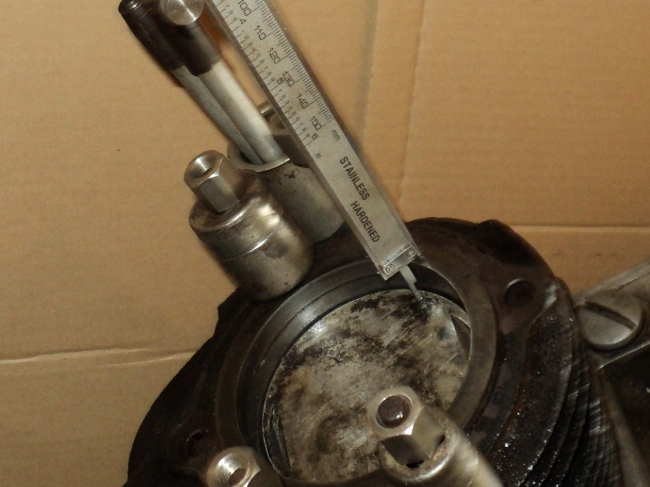 The magneto has a matching disc on its input shaft and you set the timing with this disc, the two parts of the coupling forming a dog clutch round a Tufnol coupling block. The magneto shaft has a taper formed on it, with a matching one in the coupling disc. A feature of a taper coupling is that the parts will lock together securely with very little pressure and once they are pulled tight the joint is difficult to separate. The only thing though is that the conical faces must be ABSOLUTELY clean before assembly, any trace of oil or dirt and the joint will slip. If however the joint is left a little slack then the shaft can be moved in the coupling disc stiffly. So what we have to do is set the piston in the correct place in the barrel, put the magneto on the platform with the coupling disc able to move stiffly on the shaft and then turn the magneto shaft until the points are JUST beginning to open, nothing to it really! First thing to do is the get the motor roughly right with the piston at TDC with both valves closed. Now fit the coupling disc, make sure that you can move the shaft in it and mount the magneto onto the platform with the points nearly opening and the magneto body able to slide on the platform. 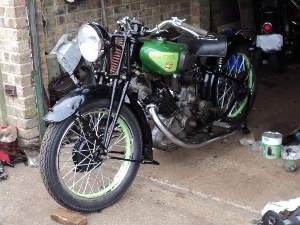 Next thing is to set the piston in place, to make things easier I’ve not fitted the cylinder head yet. A snag appears, the vernier is not calibrated in fractions of an inch but a quick look up says that 19/32nds is equivalent to 15.09mm. Using the vernier as a depth gauge it shows that the piston is 3.07mm below the top of the barrel at TDC so I set the vernier to a total of 18.16mm, wind the piston backwards down the bore and then, using the vernier as a marker bring the piston up to that position. Now we have to set the magneto, first thing is to set it to the full ignition advance position, the Panther magneto runs anti-clockwise at the shaft, clockwise at the points so you set the points cam to fully anti-clockwise. And now comes the use of a special tool, the good old-fashioned cigarette paper!. Tear a strip about 10mm wide from a new paper and slip it between the points, hopefully it will be gripped by them but if not then turn the points back anti-clockwise until they do grip it. Now GENTLY pull on the paper as you turn the points clockwise until then paper will JUST move from between them, first couple of times you try this you’ll either pull too hard and tear the paper or turn the points too far forwards but just try again but you soon get the feel. 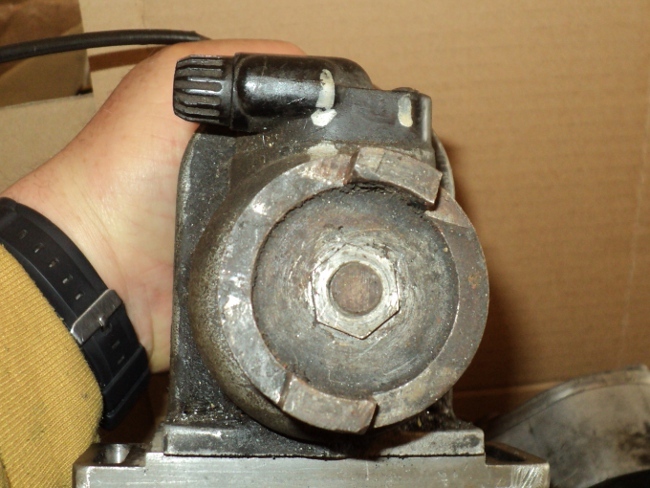 Once you’re happy then push the magneto firmly forward to press the coupling disc home on the shaft and lock the taper then, without moving the couplings, carefully take the magneto off the platform and tighten the nut securing the coupling disc onto the magneto shaft. Last thing is to refit the magneto on to the platform, making sure the dog-clutch of the coupling is not 180 degrees out of phase! 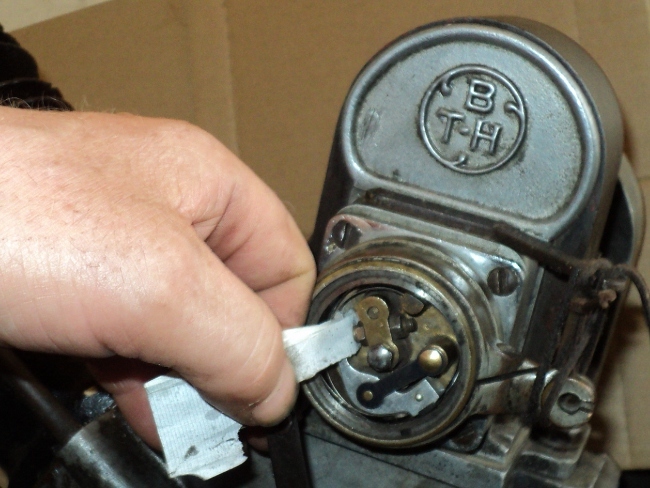 and bolt it down in place and then check the timing by putting your cigarette paper between the points again, turning the motor backwards past the timing point and then slowly turning it forwards while keeping rension on the paper till it just slips between the points. Now measure how far your piston is down the bore and if it is in the correct place then it’s a case of Jobs Done! This entry was posted in Panther on July 16, 2013 by Drew. As I have the bike up on its wheels now it’s time to start getting some of the tinware sorted. 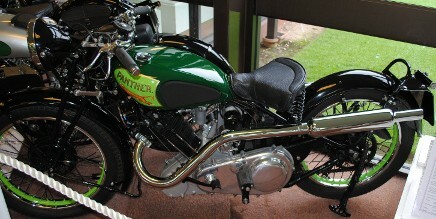 First one is the front mudguard so fetch it from the cupboard and take it out to the garage. It’s offered up and becomes immediately obvious that the front wheel has to come out, so it’s a case of lift the front end of the bike up onto the front stand and drop the wheel out. The guard mounts onto a lug under the lower yoke of the main girder of the fork, I try mount the guard with a 1/4 bolt and promptly realise that it needs a 5/16 so it’s go and get the other bolts and realise that I’ve only a limited supply of 5/16. Anyway there’s one that’s right for the bridge mount so I go to fit it. It won’t go in!. Turns out that both the lugs on the mudguard and on the fork are clogged with paint so remove that and the mudguard is mounted onto thefront fork for the first time in over 20 years. The front stays are bolted in place after running a tap through the fork mounts but when I go to attach the front stand it does not align with the brackets on the guard, I think that over the years it was unmounted the guard has relaxed a bit and is now a greater radius than it was originally. I now have 2 options, either make up new, longer mounts or try to strain the guard back into the original curve, I suspect that the first course will be the easier. 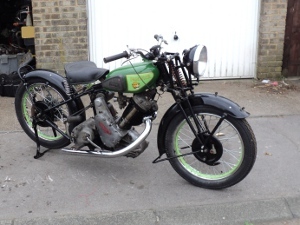 Before doing that though we’ll get the back mudguard fitted. This offers up into place easily, then I realise that I can’t get my fingers between the tyre and the guard to fit the nuts in place. So now it’s the back wheel that has to come out! Turns out that this guard has relaxed a bit as well! However I bolt the front lower mount in place and then the rear stays-come-grab handle. This leaves the centre mount, onto the seat bracket, about an inch clear of the guard. I grab hold of the grab handle and pull it towards the front of the bike and the guard and the seat bracket promptly align. A webbing strap was then put between the grab handle and the main frame and used to strain the guard into place and the seat bracket/mudguard bolt fitted. Last thing for the day was to fit the stand spring so the lower end was hooked onto the stand leg a cord fixed round the upper one and it was stretched into place. One of the Murphy Laws now came into force because as soon as I took the bike of its stand I realised from the way that it fouled the frame that I had fitted the spring upside-down. So, back up onto the stand, remove the spring and reverse it. Easier to say than to do! and this time the spring was clear! This entry was posted in Panther on July 10, 2013 by Drew. Now that the frame is up onto its wheels its time start to hang bits on it. While at first sight I want the mudguards on next, in fact it makes more sense to fit the gearbox first, so that’s the next job. So it’s disinter the gearbox from the back of the garage, get the Gunk out and clean the old crud off it. Straight away I spot that the kickstart spring has broken, I’d forgotten about that!. 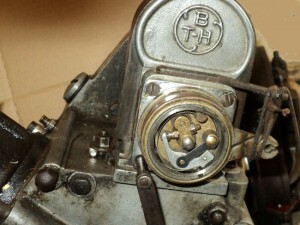 Anyway with a Burman gearbox it’s easier to work on it in the frame than on the bench so it’s on with the job. 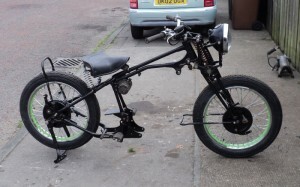 This bike uses the older adjustment method where the gearbox pivots on its bottom mounting bolt and primary chain adjustment is with snail cams on the top mounting bolt. So its drop the box into the frame and slide the bottom bolt into place without the spacers between the box and the engine plates. Next swing the box so the top bolt can be slid into place to locate everything and then slip one of the spacers into place between the gearbox top mount and the engine plate. As everything has to be a neat fit the other spacer won’t, quite, go into place. So it’s a case of wedging the engine plates a little further apart until the spacer will push into place and once it has been fitted slide the mounting bolt into place and fit the snail cams onto that bolt. It’s not tightened up yet though as the spacers still have to be fitted to the lower bolt so it matches the top one. Now I find that the new battery mount plate I had made does not fit properly, it will foul the rear mudguard and is fouling the top of the gearbox so that has to come off to be “adjusted”. Since the bikes now on its wheels with the gearbox in place I decided to put the tank on to get an idea of what she’s going to look like. Suddenly its a bike again rather than just an assemblage of parts. As a “By The Way”, at the weekend I went to Helmsley Steam Fair. This entry was posted in Panther on July 9, 2013 by Drew. In the last note I said that I’d fitted a set of tyres onto the wheels. Well I’ve now gone a stage further and have fitted those wheels back into the frame. Needless to say it was not as straight-forward as that since I had to sort out the spacers to get the wheels where they should be in the frame. Then I had the back wheel in and tightened up when I realised that the brake anchor arm was not on its peg, comment of “Oh Dear!”, remove the wheel again and refit it. Then the sprocket bolts were fouling then frame. 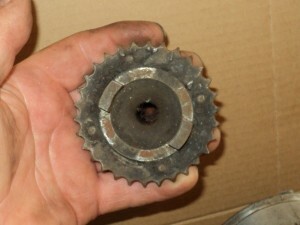 (The sprocket has been re-toothed by turning off the old teeth and bolting on a new set of teeth). So it’s out with the wheel again, remove the sprocket and refit the wheel once more. This time the wheel would spin ok but there’s something just catching inside the brake assembly as when you spin the wheel you get a “tick – tick – tick” as it turns but I’ll leave that for now. With the frame up on its wheels now the feeling is that the back of the job has been broken and I’m now on the downhill run to completion. This entry was posted in Panther on July 8, 2013 by Drew.